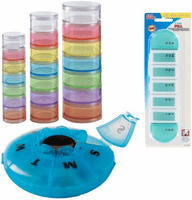 Scroll down to see our selection of pill management and pill organizers for sale. Pill management and pill organizers are used by individuals taking multiple medications throughout the day, week or month. We carry a large selection of pill organizers for sale including 7 day pill organizers, am/pm pill cases, extra large pill reminders and pill organizers for multiple daily doses. What is pill management and pill organizers? Pill management is any method of organizing medications that are taken daily. Pill organizers are devices that can hold a day, a week or a month’s worth of medication taken on a regular basis. Some pill organizers have multiple compartments per day for separating out medications that need to be taken at different times of the day. With their compact design, pill organizers for pill management can be used at home or on the go.